This page may require cleanup to meet basic quality standards. The specific problem is: more general overview, link only to official solutions (uplay, steam, origin pages). You can help by modifying the article. The discussion page may contain useful suggestions. 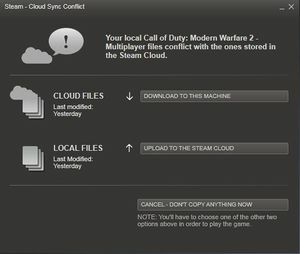 Steam Cloud - cloud sync conflict. Save game cloud syncing is the process of having save game data automatically synced to cloud storage. Automatic backup protects against catastrophic data loss like hard drive crashes. Seamlessly continue a game on another PC without having to manually transfer save data. Ability to store save games for long term retrieval (useful for series such as Mass Effect which spanned over 4 years). This page was last edited on 29 April 2017, at 19:53.